It's a Fisher-Price #FPMommyMoments Twitter Party! Many moms will agree that those special moments you share with baby are among the most memorable moments we will ever have. Whether it's enjoying baby's first bath or watching baby roll over for the first time, we will never forget the emotions that arise when we witness a special milestone. To help today's busy mom make the most of her time together with baby, Fisher-Price, the world's most trusted brand in toys, is there to support parents with toys geared to each and every stage of your child’s growth, including all those special milestone moments. Their wide range of innovative baby gear and engaging toys continues to expand to support babies as they grow and help ensure those unforgettable #FPMommyMoments. 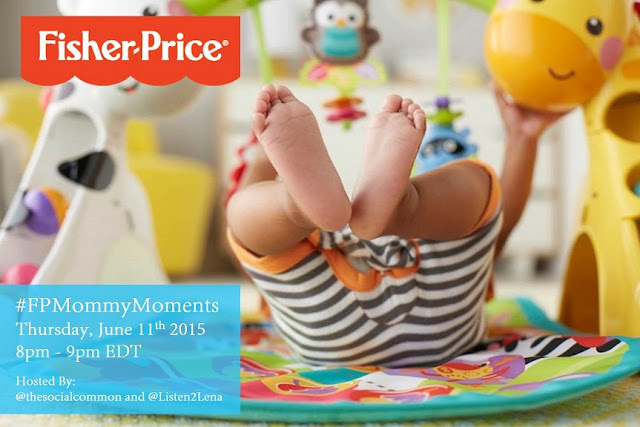 To celebrate, we will be chatting about those special moments and giving away some incredible Fisher-Price prizes at the #FPMommyMoments Twitter party and you're invited! Lots of great prizes, have fun everyone! Fisher Price is awesome. It will a great party! Such a big fan of Fisher-Price. I am looking forward to this! Looking forward to this party! Sounds like it's going to be fun party! It sure will be. Hope to tweet you there! Fisher Price has the best toys for little ones. We have so many in our home.